When tourist brochures tout a locale as ideal to "get away from it all", they mean it in a figurative sense. Except if the leaflet happens to be for my most recent destination, which prides itself on being the most isolated inhabited place on Earth. A five hour flight from anything else, Easter Island is and feels extremely remote. Arriving on the tiny speck of land, a 24x12 km outcrop of volcanic rock half-way between Chile and Tahiti, one immediately realizes that this place is something else. The dreamy little village of Hanga Roa has been spared mass tourism, and only a few tenacious travellers (and a bunch of frequent flyers on an impossibly cheap fare sale, I hear) mingle with the Rapa Nui, as the islanders call themselves. Even today, life feels precarious, with the population dependent on twice-weekly food delivery planes from Chile, and the odd supply ship for anything else - from toilet paper to power generators. This adds to the sense of adventure, and makes you appreciate the extreme conditions under which the island has been populated. It could have been as early as the 13th century, explained our tour guide, when the first Polyneasian settlers arrived on the island, which they found lush and fertile. Their population quickly grew, and with time a unique culture formed. The Rapa Nui considered themselves the Navel of the world, with nothing but an endless ocean surrounding them. And so, with nowhere to go, and no foreign influence for centuries, they turned their energy and strive to an inwards-focused culture, the most visible result of which are the iconic Moai - the mysterious stone-faced statues that have become a symbol for the end of the world. Seeing them for the first time leaves you with a sense of having arrived at the final frontier, and the mystery of how they were built and transported will intrigue even the most rational of minds. For the past 150 years, various archeological field studies have explored the island and have come up with several explanations for this unique culture, and its sudden demise. Our guide, himself part of a 1968 expedition, palpably described how western scientists tried to understand the place, and his stories of skeletons, spirits and cockroaches would be worthy of an Indiana Jones movie. 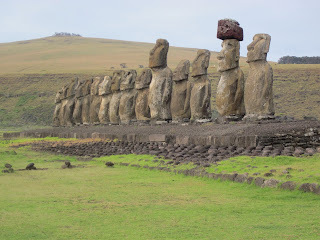 And although not typically prone to sudden attacks of mysticism, seeing the quary where half-finished moai await completion, and then the completed, rock-solid statues on pedestals kilometers away, left me deeply intrigued. Add to this hidden crater lakes, wind-swept arid planes and the incessant turquoise waves battering the cliffs, and it makes for a truly outlandish getaway. The "Star Trek planet of the week" image came to mind more than once - even Spock would have found it fascinating. If anything, there was only one disappointment on this trip: Despite relentless search, I couldn't find a single chocolate Easter Bunny!